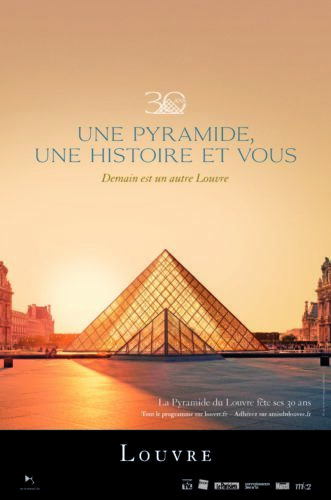 The Louvre Pyramid was inaugurated on March 29, 1989 by François Mitterrand, the President of the French Republic at the time. The construction of this monument represents a highlight in the history of museums and an array of festive events will be held to celebrate its 30th anniversary. The program of events begins in the spring with a collaborative work by the artist JR and ends in the fall with the exhibitions “Leonardo da Vinci” and “A Tribute to Pierre Soulages.” It also features an open-air photo exhibition with Paris Match magazine, a free symphonic concert under the Pyramid on June 21, and a dance performance by the choreographer Kader Attou. The “Grand Louvre” project, announced in September 1981 by the French President François Mitterrand, was designed to expand the museum by taking over the wing of the palace occupied by the Ministry of Finance. This huge project was an opportunity to redesign visitor reception and the presentation of the artworks. A two-fold increase in the exhibition space (from 31,000 m² to over 60,000 m²) required a complete overhaul of the museum’s entrances andvisitor itineraries. The American architect Ieoh Ming Pei had the idea for a simplified entrance via a 21-meter-high glass pyramid in the center of the Cour Napoléon—a plan that sparked considerable controversy in the media and public opinion, where the architect was much criticized for this bold addition to a monument that symbolized the history of France. Unprecedented archeological excavations in the Cour Napoléon and the Cour Carrée unearthed the Louvre’s medieval foundations, dating from the reign of Philippe Auguste. This first major preventive archaeological project in an urban setting saw the creation of the French National Institute for Preventive Archeological Research (Inrap). Today, the Pyramid is considered one of the icons of the world’s most famous museum. In 2018, the Louvre drew over 10 million visitors, of whom about 70% were foreigners. The Grand Louvre revolutionized the visitor experience, making it easier to move from one museum wing to another and providing new facilities such as a cafeteria, a book and gift store and an auditorium.